In some ways, though, maybe it was better that I stood on my own two feet from a pretty young age. Jimmy goes one better, telling me that at 11 years old he was running around, doing the shopping for three different aunties which took him the whole of Saturday. He’d also build the fire and make the house all toasty for his parents coming home from work – that’s after digging over the veg patch and re-pointing the house. What did our offspring do at that age? Come in, throw down an array of bags and coats and flop in front of the telly. Sometimes, I like doing stuff for the kids: ironing a shirt, or picking up a requested item from the shops. But, while it makes me feel pleasingly motherly, I do wonder if I’m a bit soft. That’s why I started to think about all the things I haven’t done – the things I’ve said no to, with no negotiation. That made me feel a whole lot better about the provisional license thing. Tough love, I think you call it… well, toughish. Getting an exotic pet. I’ve been bombarded with requests for bearded dragons and snakes (what is about scaly things in tanks?). When my friend Annie allowed her son to get a dragon, she was rewarded with a bite on the hand. It’s not that I have disallowed all pets; we’ve had fish which resided in a murky tank, and two rabbits, neither of which lived to pensionable age. And we have a dog, Jack, who we don’t really regard as a pet at all – he’s elevated above pet status. But honestly – I don’t think I could sleep, knowing we had a reptile in the house. Buying everything out of Hollister. The brand seemed to have a moment a year or so ago, and I was nagged about buying very ordinary items from there at vastly inflated prices. You’re probably aware that Hollister stores are pitch black inside, and staffed by impossibly beautiful people. So I refused to go in, saying that I wasn’t prepared to humiliate myself by standing on some model’s foot. Also, without special night vision, you can’t possible tell what colour anything is. Inviting the whole class to a party. In fact, hosting any kind of lavish kids’ party at all. Entertainers, limos, live pumas bursting out of cakes – there’s no need for any of it. All kids care about is lots of rubbishy food and friends to run around with. As long as you don’t offer rice cakes, or become too dictatorial over the games, everything will go swimmingly. I think the trick is not to start offering very much in the way of entertainment, then you’re not expected to up the ante every year. I was trying to think of more things I’ve said no to – but I ground to a rather premature halt. Which probably suggests that I am a pushover, and that my friend was absolutely right. Er, what do they want to do? What most teenagers do, I suppose. Hang out with friends, scoff gargantuan amounts of food and then, when the kitchen’s been cleaned, ask if there’s anything at all in the house to eat. They want to watch movies. Lie in. Poke at their phones and channel hop, while we wait, patiently, to watch our own box set. Isn’t that what being a teenager is all about? Only, that’s not what they mean at all. When people ask, ‘What do they want to do?’, they’re actually saying, ‘So, what kind of futures are they mapping out for themselves?’ And I always want to reply, ‘D’you think anyone actually talks to me?’ Instead, I usually mutter a few things they’ve mentioned, casually and in passing – but it’s never enough. And so the enquirer turns to my kids, and no one says much and it’s all horribly awkward. Things were much simpler when they were little, and they’d say, ‘I want to be a pirate/astronaut’ and look all excited and happy. Everyone was satisfied with an answer like that. I remember this stage of my own life. At 17 years old, for want of something to say, I’d blab that I wanted to be an illustrator. Then, when I failed to get into art college, everyone had to act all sorry and suggest alternative careers. To cheer me up, Mum suggested I apply for a job as a cleaner at a hospital. I don’t know which department I wandered into in my shy and nervous state, but it was clearly the wrong one as, instead of being interviewed, I was handed a small kidney-shaped bowl and asked to go into a cubicle and wee in it. ‘Well,’ I thought, ‘if I’m going to be working with sick people, maybe they need to check I don’t have any diseases.’ I sat there and tried and tried to wee – nothing. Not a drop. What a failure I was, being turned down for art school and now, to top it all, I couldn’t even pee in a bowl. I think teenagers tend to be surer about what they don’t want to do. Eg, like having to wear a suit and tie and trot off to an office every day. Because no sets out wanting to do that, do they? No one, at 16 years old, announces, ‘I can see myself working for Standard Life.’ There’s nothing wrong with such a career choice, of course – it’s just, they tend to imagine rather more, um, exciting prospects for themselves. Working in call centres, or for insurance companies and banks, is for parents – ie, ancient people. ‘It nearly killed me,’ my friend’s son announced, somewhat over-dramatically, after completing five days’ work experience at a solicitors’ firm. Last summer, we had a family weekend in London. As the five of us strolled along the South Bank, we happened to glance into a huge office block where people were beavering away. ‘Ugh,’ snorted one of my kids, ‘imagine doing that every day.’ I wanted to say, ‘D’you know what that place is? It’s IBM! Don’t you think that might be a pretty interesting company to work for?’ I managed not to, though, because I’d made a rule to stop harping on about jobs and prospects and futures. Don’t worry – not everyone’s academically minded. Have you thought of applying for something with the council? I think I read that McDonald’s have a good training scheme. Did I tell you our Daniel is studying law? At OXFORD? Poor you, following in your highly-successful brother’s/sister’s footsteps! Don’t you have ANY idea of what you want to do? There are no jobs out there. None at all. I’d been away for three days for work. No big deal, I know – I didn’t expect champagne and bunting to herald my return. But… a tiny bit of fuss would have been nice. A hug, or a resume of all the things I’d missed. ‘Did you have a good time?’ asked one of my sons, gazed fixed upon his iPad. Yes, fine, thanks,’ I replied, setting down my suitcase. And that was that. Clearly, family life had trundled along fine without me. No one appeared to have been excluded from school, developed scurvy or even noticed my absence particularly. I sloped upstairs feeling thoroughly disgruntled, until it occurred to me that… this is what’s meant to happen. Indifference to parental comings and goings, I mean. And it’s okay – it really is. Sure, it takes a little getting used to, but think how weird it would be if your adoring offspring remained that way forever. It’s lovely, being watched intently by a three year-old while you apply your make-up. Imagine, being that fascinating to anyone! But if a seventeen year-old were to behave like that, I’d assume drugs were involved, or that they were building up to make some terrible announcement. ‘What is it?’ I’d keep barking. ‘WHY ARE YOU STARING AT ME LIKE THAT?’ My blood pressure would be through the roof. We know, of course, that children are programmed to gradually separate from us, progressing from occasional eye rolls to full-on communication avoidance. For me, the toughest time was when they hit the 12, 13 mark. I wasn’t prepared for my once-loving children to suddenly regard me with disdain. Then, gradually, the distance between us began to feel normal. And as soon as I’d accepted it as a perfectly healthy developmental stage, I stopped the loitering, the snivelling and bribing them to hang out with me. They were stretching their wings. That’s what kids are supposed to do. Anyway, it’s not all bad news, this feeling of being slightly redundant and not knowing what to do with ourselves. Here are some unexpected – and quite delightful – things that happen as the kids start doing their own thing. – If teenagers seem aloof, it’s because they are busy thinking about the world. Like this Ukraine situation: ask an older relative what’s going on, and they’ll have you pinned to the wall for 17 hours until you have to invent some domestic emergency to get away. But ask a teenager and they’ll come back with precisely the kind of short, digestible response you required. – You’re not needed. Of course, you hope you’ll always be their first port of call whenever they’re worried or sad. What I mean here is being ‘needed’ in a cutting-up-food, dabbing-lotion-onto-verrucas kind of way. The tedious stuff which we didn’t mind while it was happening – but don’t exactly mourn when it’s all done. – You feel more united as a couple. When your kids won’t hug you anymore, you and your partner are likely to seek solace in each other. Happily, there’s more time to be ‘romantic’ (ahem) now you no longer have drifts of Lego to sweep up. Plus, nothing creates a sense of solidarity like being regarded as a pair of imbeciles by your kids. – You and your teens can enjoy a new way of relating to each other. I mean, what choice is there? They’ve made it clear they don’t want you checking their homework or arranging their pizza toppings to look like a face. – You can do what you want. 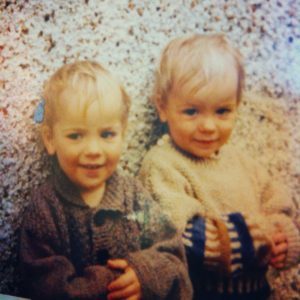 When our boys were tiny, virtually every sentence Jimmy and I uttered to each other started with ‘I’m just…’ ie, ‘I’m just… going to the shops/kitchen’ (which implied, ‘Is that okay with you?’). We were shattered and stressed and felt it necessary to keep each other under constant surveillance. You couldn’t have a pee without asking if that was all right. The one time Jimmy ventured off piste – ie, went to the pub without written permission – I threw a cake at him. Those days are long gone. Now we just say, ‘I’m going to town and then I’m meeting Andy for a drink.’ And that’s that. No wrangling, no negotiating, no ‘I’m just.’ God, it makes me so happy to be able to type that. Our first kid-free holiday in 18 years… what will we do? Family holidays were easy when the kids were little. Well, not easy exactly. By the time I’d finished packing I’d be utterly exhausted (although Jimmy could never understand why I made such a big deal out of preparing for a trip. ‘You should be like me,’ he gloated. ‘A couple of T-shirts and a pair of shorts and you’re done.’). I would have laughed – bitterly – had I not been busy packing a million items of kids’ clothing, toys, board games, DVDs and inflatable tortoises, plus all the medical stuff for every possible emergency, which apparently we didn’t need – because just a couple of T-shirt and a pair of shorts and you’re done. Anyway, once we were away on some gorgeous beach, all my stresses would melt away. The kids were happy to run in and out of water all day. But it’s been a long time since anyone collected razor shells or dabbled about in rock pools. 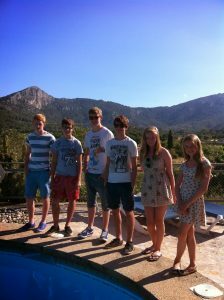 The pic above was last summer, when we rented a house near Pollensa in Majorca and took our three teens, plus three of their friends – it was brilliant. The kids totally took over the barbecue and we barely did a thing (apart from Jimmy, who drove the terrifying 9-seater car around mountain roads). But this year, everyone is doing their own thing, or being taken away by friends’ families. So Jimmy and I are going away on our own. Just the two of us! We haven’t done this for eighteen years. I’m sort of bereft and delighted. Last kid-free holiday we still used travellers’ cheques and took about five minutes to pack (camera, Birkenstocks, pants). We didn’t have mobile phones or any other twittering gadgets. So it all feels quite different this time. It took about six months to decide what to do, the choice was so boggling. And now I wonder what we’ll talk about for a whole week. Also, we’re so excited I worry we’ll over-schedule ourselves and either do too much or too little. And it’ll be odd, lying on a beach with no one kicking sand all over the food or trying to bury us. And how will we amuse ourselves without running off for ice cream and snacks? There’ll be no one moaning if we suggesting going to see some Boring Art, or demanding lobster off the menu when we stop for a quick lunch. ‘No, you can’t have the lobster, I hate to be mean – but it is £800.’ The holiday house cleaner won’t drive after us in a furious rage to the airport, due to a grubby handprint on a bedroom wall – as happened to us in Corsica. We won’t be fined for shoving a glass down the inner workings of the pool (‘I was trying to trap ants!’) – as happened in Sicily. No one will perch on a radiator and accidentally pull it off the wall (Brittany) or puke in the hire car (everywhere). We will not have to park a big suitcase in front of the dent in the hire car when we return it, which happened because everyone was shouting in the back and Jimmy reversed into a pillar. Also, no one will look disgusted at the sight of us in our bathing wear. At least, no one who knows us. I can’t bloody wait. Well, that’s the prelims over, and the real exams are hurtling toward us, and after that – that’s IT. At 17 years old, for want of something to say, I’d blab that I wanted to be an illustrator. Then, when I failed to get into art college, everyone had to act all sorry and suggest alternative careers. To cheer me up, Mum suggested I apply for a job as a cleaner at a hospital. I don’t know which department I wandered into in my shy and nervous state, but it was clearly the wrong one as, instead of being interviewed, I was handed a small kidney-shaped bowl and asked to go into a cubicle and wee in it. Eg, like having to wear a suit and tie and trot off to an office every day. ‘That’ll never happen to me,’ they think, because no sets out wanting to do that, do they? No one, at 16 years old, announces, ‘I can see myself working for Standard Life.’ There’s nothing wrong with such a career choice, of course – it’s just, they tend to imagine rather more, um, exciting prospects for themselves. Working in call centres, or for insurance companies and banks, is for parents – ie, ancient people. ‘It nearly killed me,’ my friend’s son announced, somewhat over-dramatically, after completing five days’ work experience at a solicitors’ firm. Here are more things it’s best not to say to a teenager who may, or may not, be contemplating the path they wish to follow in life. Did I tell you our Daniel’s studying law? At OXFORD?